iPad Art Room » What is creativity? Let’s hear from Sir Ken Robinson, one of the leading voices on this subject. “I define creativity as the process of having original ideas that have value. Creative work in any field often passes through typical phases. Sometimes what you end up with is not what you had in mind when you started. It’s a dynamic process that often involves making new connections, crossing disciplines and using metaphors and analogies. Creativity is about fresh thinking. It doesn’t have to be new to the whole of humanity – though that’s always a bonus – but certainly to the person whose work it is. Creativity also involves making critical judgments about whether what you’re working on is any good, whether it’s a theorem, a design or a poem. Encourage and develop creativity by teaching students to find a balance among synthetic, analytic, and practical thinking. A creative attitude is at least as important as are creative thinking skills (Schank 1988). The majority of teachers want to encourage creativity in their students, but they are not sure how to do so. Those teachers and you can use the 15 strategies presented below to develop creativity in yourselves, your students, and others around you. Although we present the strategies in terms of teachers and students, these strategies apply equally to administrators working with teachers, parents working with children, or people trying to develop their own creativity.” Read the entire article from Sternberg & Williams here. 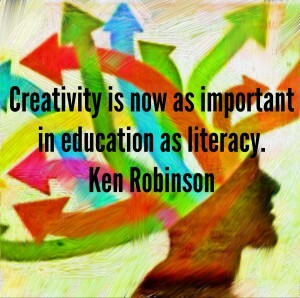 Related posts: See our Ken Robinson Collection, creativity infographics and Two Dozen Tips for Teaching Creativity from Sternberg & Werner here.